This Irish Mule combines Irish whiskey, ginger ale and lime for a fun twist on the classic Russian cocktail. Serve it in copper mugs to keep it icy cold! Thank you Dr Pepper Snapple Group and Pernod Ricard for sponsoring this post. Is it just me or is summer just one big 4-month-long reason to celebrate? This summer has been flying by and I feel like we’ve been savoring every moment. Nick has been gone for the last month, doing some training for work out in the middle of the ocean. Lucky for me, I was bouncing around the country on several different trips during the month he was away, so it went by pretty quickly. Now that he’s home, he’s all about enjoying what’s left of summer on dry land! To celebrate summer and catch up with friends, we love having mini dinner parties. Any night can be special with good friends, fresh flavorful food and some easy cocktails. Sunday Funday, Thirsty Thursday, Poolside Party? It’s summer– just celebrate. Last summer, the Moscow Mule cocktail was all the rage. We definitely got on that bandwagon and rode it hard. It’s such a tasty and refreshing summer drink. This summer, it was time for something new. Since Nick is a whiskey guy, I thought it would be fun to swap out the vodka for whiskey and try out an Irish Mule! It’s a simple drink that only requires 3 ingredients, so it’s quick and easy to make. 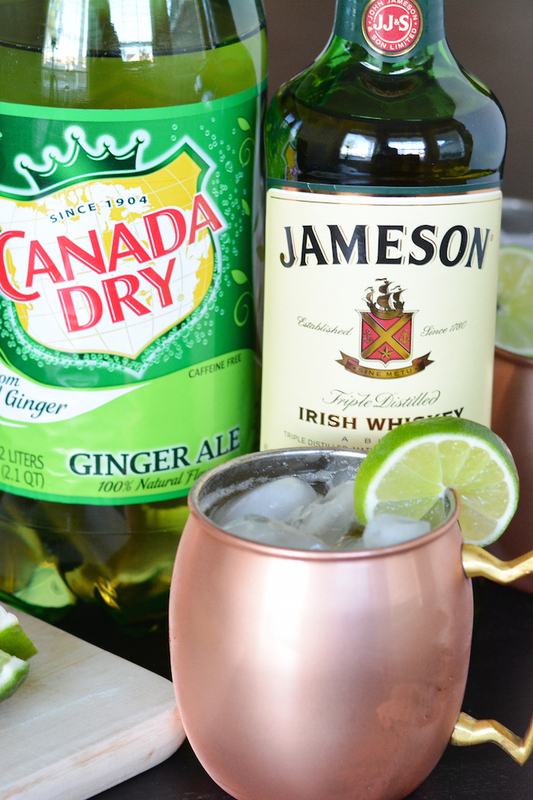 For our Irish Mules we used Jameson® Irish Whiskey, Canada Dry® ginger ale and fresh lime juice. 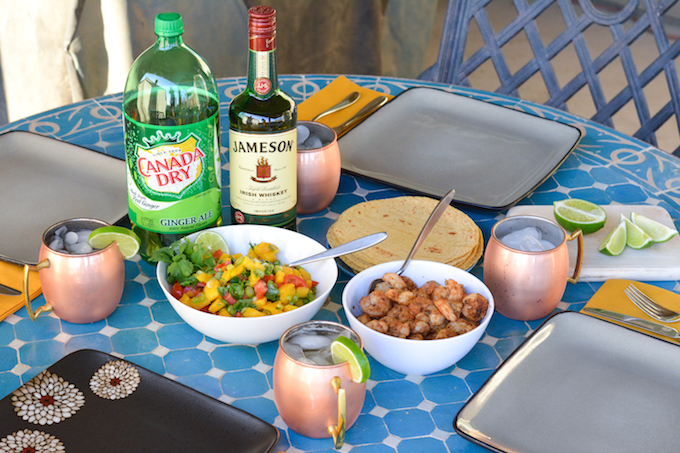 We had a couple friends over last week to celebrate Nick’s return and test out our Irish Mules. I made these yummy Shrimp Tacos with Mango Salsa. This is a recipe I make all the time because it’s so easy but delicious. I really need to update the photos on that old post!! They may not be very Irish, but they were perfect for a group and are an easy, light summer meal. We dined al fresco and enjoyed the sunset as we ate. Fun cocktails really make a party and I loved how easy this one was to put together. Everyone had a great time sipping and eating. It was the perfect way to spend a summer evening. What are your favorite ways to celebrate summer? Eating outside just seems to make me so happy! I wish we had a pool to sit by, but maybe some day. For now I’ll take the warm weather and cool breezes. Fill a glass (or copper mug!) with ice. Add whiskey and lime juice and stir. Serve with a lime wedge! What are you celebrating this summer? What’s your favorite summer cocktail? I agree about summer being a 4 month long celebration, if only it didn’t go by sooo fast. I also feel like I totally need one of these drinks right about now! Yum! It sounds like you are having a really fun summer!! I feel like I need to be doing more fun things, haha! Or at least drinking more fun drinks like this one! I’m usually a wine girl, but I totally go for one of these right now! Yep, fun drinks are an essential part of summer! Thanks, Izzy! Being busy definitely helps the time pass when they are away! I love your twist on the Moscow Mule. Those drinks are so popular where I work so this recipe is a great mix up to it! Thanks, Shelby! They’re definitely a trendy drink, but so yummy too! Summer is flying by way too quickly so we totally need to make it count by celebrating with some fun drinks like this! I know, Kelly! It seems like summer gets shorter and shorter every year! Yum! This looks so refreshing and perfect for summer! Summer is definitely a happy time, but I am also really excited for fall so I can eat soup and chicken pot pie every day :). 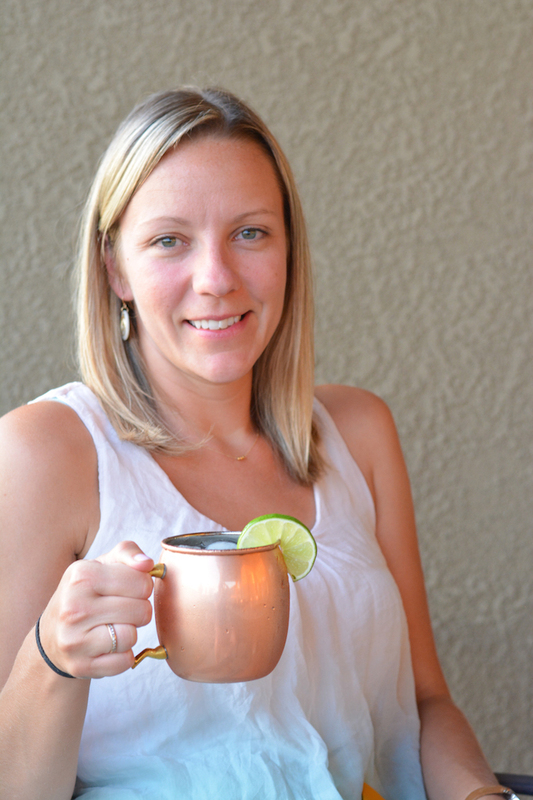 My sister-in-law loves moscow mules, but I’ve never had one. I think I’ll start with this Irish version — it sounds delicious with that Irish whiskey! Yes!! My hubs is obsessed. Whiskey is definitely his drink! This drink sounds perfect, Jess! 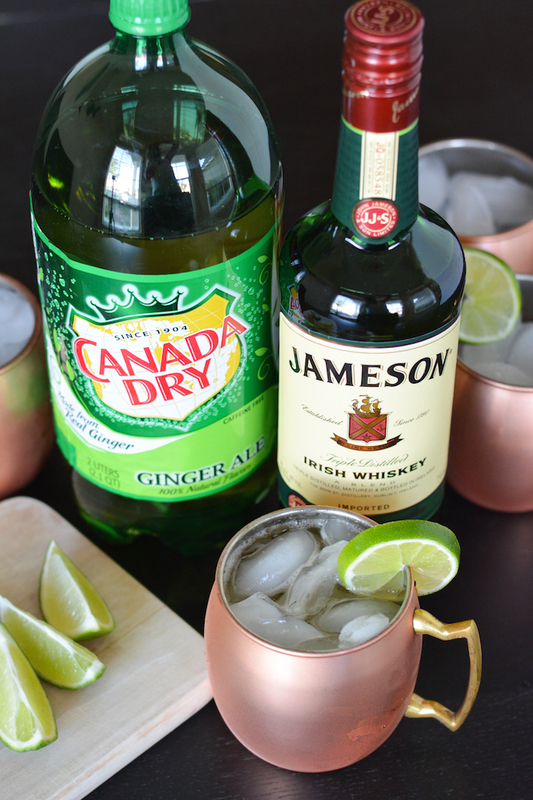 I just recently had a moscow mule for the first time, so I can’t wait to try this version. Sounds so refreshing! What an awesome drink, I’ve never tried a “mule” but I definitely will have to try one out now! Thanks for sharing! Good recipe but I’d respectfully suggest using a ginger beer instead of a ginger ale. GB’s have a stronger ginger flavor which is needed to stand up to the acidic elements of lime and the whiskey…in a pinch, GA works but it can easily get lost in the background here. Cheers! 100% this! 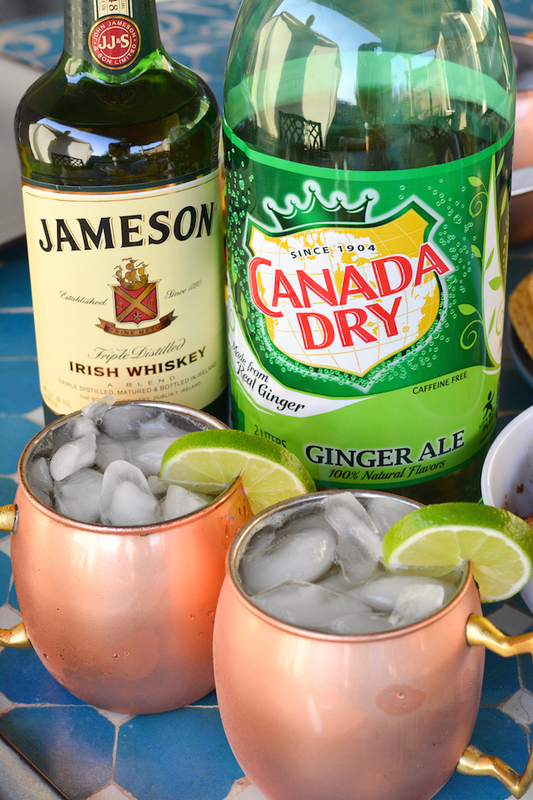 Ginger beer is the only way to make a mule! I’ve found that Fever Tree ‘light’ ginger beer is by far the best- no added sugar and a pronounced but not overstated ginger taste.